Safety – creating the best conditions possible for motorists to get from A to B without incident or harm. Supporting Economic Growth – responding to economic shifts to keep business and industry moving on B.C. roadways. Mobility – enabling a timely, reliable traffic flow that efficiently handles the number of vehicles on B.C. roadways. Public Concern – listening to citizens, whose needs often relate to the factors above. These “fab four” reflect our goal to move people and goods safely while driving economic growth and trade. Our projects come under two different categories: rehabilitation, to repair and maintain the current road system; or new infrastructure, to expand existing routes or create new ones. In the case of rehabilitation – maintaining and repairing existing structures – we do preventative maintenance to keep our current infrastructure in the best shape for as long as possible. 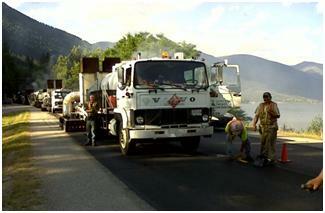 We monitor and inspect each inch of our road system regularly to check its condition. Keeping track of bridge and road conditions, and road smoothness, is especially critical. Planning starts with a 10-year time frame, to forecast the need for maintenance, and align funding for the work. Once the plan and funding are in place, a more detailed four-year plan is mapped out. Here, technical level plans are prepared, bringing projects into sharper focus. Then it’s down to the nitty-gritty plan for each year which comes to about 300 to 400 rehabilitation projects. For some large, new projects, planning also may start up to 10, 20 and even 30 years in advance. We project growth and demand for upgrades to existing routes, and whole regions. Beyond monitoring the physical state of our infrastructure, we look at how it’s being used. We study things like traffic volume and flow, timing, speed and congestion. As well, we review our collision information and work with stakeholders such as local government, RCMP, industry and the public to identify locations where there are concerns. We carefully analyze these details with a view to potential improvements, benefits and costs to ensure the investment is the right investment in the right location. Over time, many of those projects will appear in our three-year service plan, where costs and timelines are projected for the work to come. With potential new projects, there’s an addition to our fab four factors – that’s cost-sharing. Local government, industry and developers sometimes want to partner up on mutually beneficial improvements, and that can propel new projects forward. Also, the federal government might contribute to projects that improve routes for trade with Asia, enhance national highways like the Trans-Canada, smooth border crossings or spur job growth. Some new projects are major and cover large geographic areas, such as the Gateway Program in the Lower Mainland, and the Kicking Horse Canyon Project. Other times, they are smaller, such as work done through the Pine Pass. Whether it’s rehabilitation work or building new projects, project selection involves a lot of communication and analysis. There are tens of thousands of kilometres of B.C. roads, bridges, guardrails, signs, ditches, culverts and other structures that make up the circulatory system of the province. So, it’s not always simple to choose which projects will receive funding from our budget – which like everyone’s – has limits. We look at what’s down the road for rehabilitation and what’s ahead for new projects, across the province and regionally. Knowing what’s on the drawing board for new infrastructure, in one location, may shape the work for rehabilitation there. For example, there might be a two-lane road due for repaving in two years, which is also targeted for expansion to four lanes within the next three to four years. In this case, the repaving may be postponed until the four-lane expansion is underway, and the funds that were set aside for repaving will be used elsewhere. Developing our plans is complex – as we work to ensure that roads can be driven as safely as possible, highways support the movement of commercial traffic, travel time is kept reasonable and public concerns are addressed. But our “fab four” ensure we’re picking our projects with purpose. I am upset and concerned about the new traffic issue on the Malahat Highway. Since the road was widened for concrete dividers (thank you) the area of two lanes southbound has been shortened. This is now causing most of the vehicles travelling in the mornings to speed (110 kms plus) at the top of the Malahat to avoid being stuck behind a slower vehicle through the Golstream area. The opportunity to pass is now lost making the traffic slow to as little as 17 km an hour from the top of Golstream down to the ice cream mountain. Can we please review and bring back the passing lanes? This would keep the many hundreds of commuters safe and happy. Thanks for letting us know of your concerns. We will pass this comment along to the project manager and let you know their response as soon as we have it. Hi again Nicole. We confirmed with the project manager that, due to the geography of the area, the highway at that location cannot be widened to allow for a passing lane without considerable extra cost and significant impact to the Goldstream area. We appreciate your feedback. The pros and cons were compared when considering adding the median barrier, and public safety was deemed the priority.